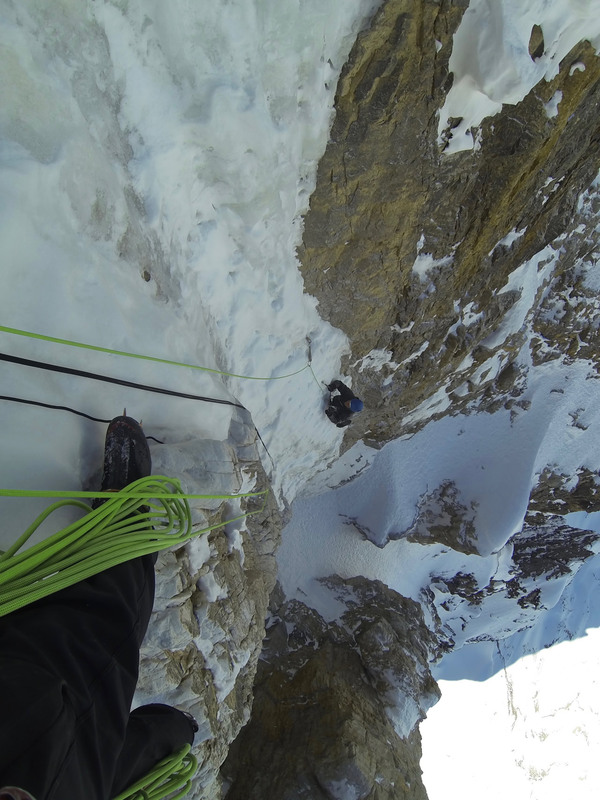 Canadian Marc-Andre Leclerc and Slovenian Luka Lindic climbed a hard new route on Mt. Tuzo (3248m) in the Valley of the Ten Peaks near Lake Louise in the Canadian Rockies. The Leclerc-Lindic route (M7+ W16+ R, 1100m) on the Northeast Face was climbed from March 31 to April 2. Tuzo was named for Miss Henrietta "Hettie" Tuzo, who was the first to climb this peak with guide Christian Kaufmann in 1906. After writing that the route was "maybe the most serious alpine route I have done" on his Facebook page, Leclerc told Alpinist, "This route was certainly much harder than the other two big Rockies routes I have done, The Wild Thing or the Greenwood-Locke on Temple. It had significant technical climbing. I have done a number of big routes in Patagonia, in the Chalten Massif, but with the advent of weather forecasting down there nothing I have climbed matches up to the Rockies in terms of overall seriousness." Tuzo is a 10,656-foot peak between Deltaform and Mt. Allen in the valley of the Ten Peaks. 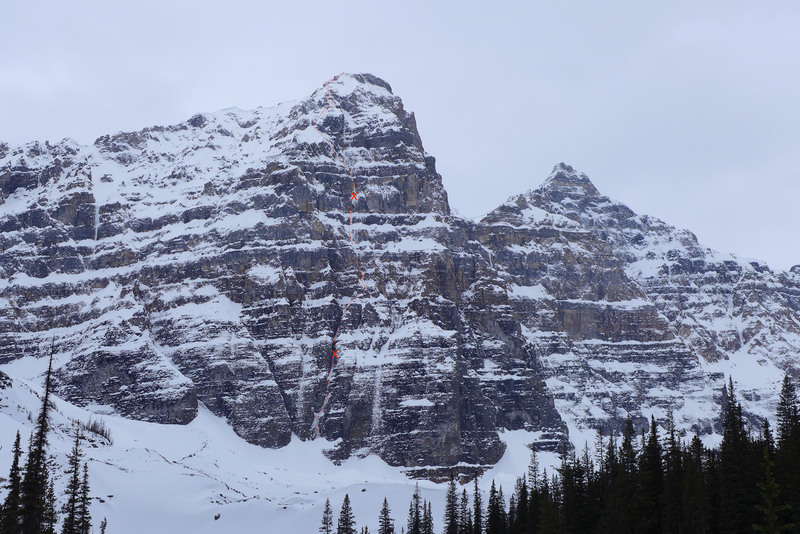 Leclerc and Lindic skied 11 kilometers along the closed Moraine Lake Road on March 30, cached food and gear near the lake, then skied an additional five kilometers to Mt. Fay, where they bivouacked. The next day they hoped to establish a direct finish to the original unrepeated East Face (5.8 WI5, Cheesmond-Blanchard-Tobin, 1984) of Mt. Fay. However, the next morning the face avalanched twice. The second avalanche actually came down the approach ramp to the route Leclerc and Lindic wanted to try. "It was a clear sign that things were not right to try Fay," Leclerc said. The pair returned to Moraine Lake to check out other possibilities and found that their cache had been invaded by a fox. "We followed the tracks through a number of caves and whatnot hoping to find the gas canister and my phone as the fox would have no use for it," Leclerc recounted. "The tracks merged with mountain lion tracks and we stumbled upon a fresh kill! It was apparent that we had scared the cat away to a nearby cave likely only a minute before!" Although they were now low on food, the pair decided to ski up the valley and continue looking around. They noticed an "incredible line linking chimneys and improbable ice features" on the Northeast Face of Tuzo. It was already 12 p.m., the pair started climbing—but they took bivy gear. 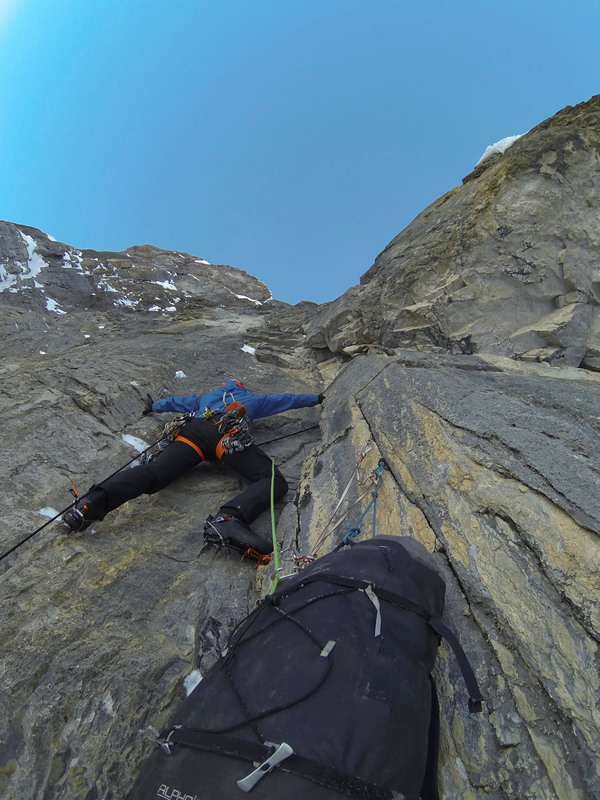 Leclerc and Lindic climbed a half-dozen pitches the first day. The third was the hardest, requiring they dig through snow mushrooms while climbing steep terrain. "I aided the first few meters initially just to avoid risking a fall onto a marginal belay," Leclerc said. "Once I found a reliable piece I lowered down and freed it. There is no sense in risking a fall onto a marginal belay just for the sake of winter free climbing or perfect style." At the end of the first day's climbing, the pair gained a big couloir, at the base of which they bivouacked. Leclerc reported frequent spindrift in the couloir but no big slides. The next day the climbers climbed "at least" 10 pitches, two of which required considerable digging through snow. Toward the end of the second day, Leclerc led a serious ice pitch that was probably the hardest he has ever climbed. "I am really reluctant to throw around the WI7 grade and it is kind of theoretical, but the pitch was harder than any standard water ice could ever form," he said. "It was 95 degrees and perhaps two centimeters thick at the crux, feet stemming on small rock edges on either side of the smear." 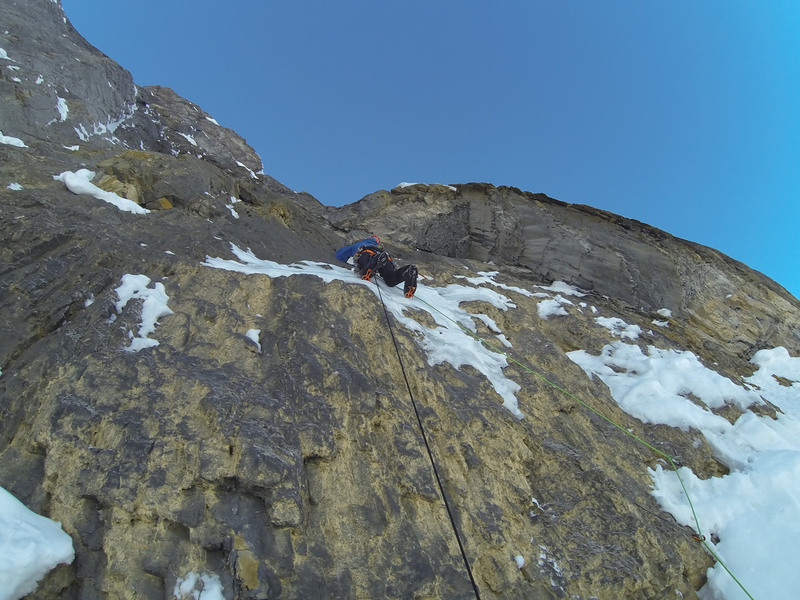 After a few more moderate pitches, they reached a two-pitch headwall that Lindic led. Both climbers freed the headwall pitches. The second headwall pitch (M7+) required them to take off their gloves so they could use of a series of sidepulls. "From the belay below I was already thinking I will need to aid my way up it," Lindic recalled. "Then, it was actually an incredible pitch of dry-tooling and a few bare hands moves on sidepulls. It's always a crazy feeling to free climb such steep terrain on a big alpine face—especially on a new route!" Above the headwall, they spent another cold night out, sitting upright at the bivouac. They each ate a single energy bar for dinner. 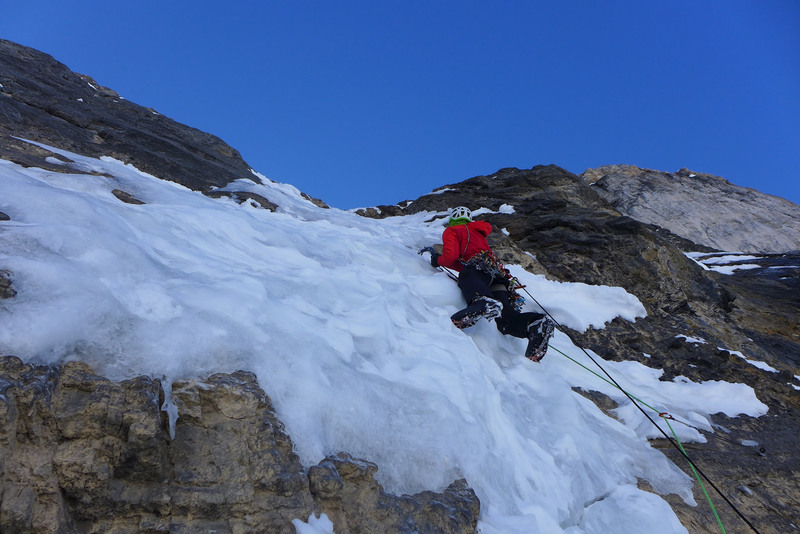 In the morning, Leclerc led another WI5 ice pitch. A few moderate pitches led to the summit. But their ordeal was not over. Leclerc and Lindic initially planned to traverse over Mt. Allen (3310m) and descend a couloir on the east side of that peak. However, now that they were looking at it from the top of Mt. Tuzo, the climbers realized that traversing Mt. Allen could be difficult. The weather was also deteriorating. They instead went the opposite direction, to the col between Tuzo and Deltaform, and began downclimbing snow until they found an ice runnel that, remarkably, allowed them to descend using V-threads to the valley floor. "Amazed by our luck, we were back at our skis around 5pm and made the long and hungry ski back to the car by 9:30 p.m.," Leclerc wrote on his Facebook page. "I would compare our new route to the Rolling Stones on [the] Grandes Jorasses I did two seasons ago," Lindic told Alpinist. "I think our new route is more serious [because of poor] rock quality and very difficult ice climbing with bad protection." This story was updated on April 12 at 4:35 p.m.
Sources: Marc-Andre Leclerc, Luka Lindic, alpinist.com, publications.americanalpineclub.org.